Please note: This item can only be shipped via ground service. Sometimes foggy windows limit your vision more than the snow, rain or other inclement weather you�re driving through and in times like that you�ll be glad you have Rain-X Anti-Fog. Made to keep your interior glass free from fog and steam, Rain-X Anti-Fog starts working instantly after your first application. Simply apply a small amount Anti-Fog with 100% cotton rag or paper towel, wipe it onto the inside of your windshield, side windows, rear window and rearview mirror, and allow it to dry. Once dry, your windows will resist fogging and steaming regardless of the outside conditions! Please be aware that you will have to re-apply Anti-Fog window treatment to help your windows maintain the non-fogging and steaming properties. This product is flammable so be sure to store below 120 degrees Farenheit and do not expose it flame or sparks. 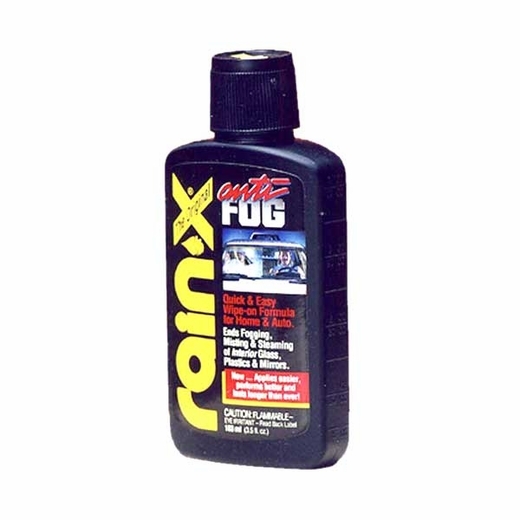 For keeping your windows fog-free trust none-other than Rain-X Anti-Fog.